Well, fall is officially here (since Saturday!) and it’s time for some of the best Weight Watchers Fall Recipes to start making their way to my blog. 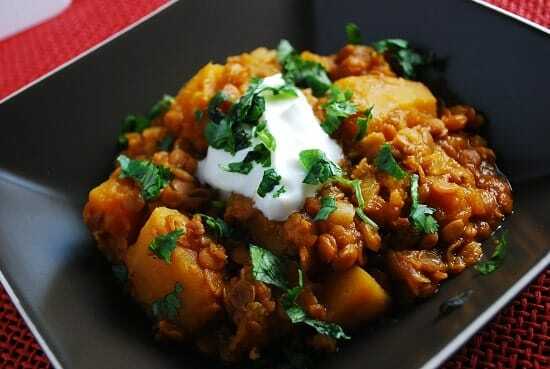 To kick things off, I decided to do this Crock Pot Pumpkin Lentil Stew. It’s a very healthy dish that’s incredibly filling, and is an excellent Weight Watchers Vegan recipe for those who eat Vegan (just leave off the yogurt). I fed this to my 13 month old, and she LOVED it. Simmering in the crock pot all day made everything so tender and flavorful…the spices were perfect. And the lime juice gives it just a bit of zing. In fact, the next time I make this, I will use more lime juice. If you want a good, hearty fall stew recipe that will really fill you up for 0 Points, then this Crock Pot Pumpkin Lentil Stew is your ticket. Enjoy! A perfect fall crock pot recipe, this Pumpkin Lentil Stew is not only hearty and delicious, but very healthy and satisfying. A great low calorie recipe idea for a chilly fall day. In a 4qt slow cooker, combine all ingredients except yogurt and cilantro. Cover and cook on low for 6-8 hours. When ready to serve, top each serving portion with an heaping tablespoon of yogurt and some fresh cilantro. This was awful – I think the balance of the spices is way off. Perhaps the cumin and ginger were meant to be tsp instead of Tbsp? Sounds delicious! But yogurt is not vegan? Any alternatives that can be used? You can use a soy based yogurt if you’d like. Or even a coconut yogurt..I’ve just started seeing a few of those recently. The worst recipe I ever made. Threw it in the garbage. Do you peel the pumpkin/butternut squash? Or do you leave the skin on? You don’t eat the strings; you eat the inch-thick (more or less) flesh between the skin and strings. You can also roast the seeds; they’re very tasty. The pie pumpkins are smaller, more flavorful and less watery than the Jack-O-Lantern pumpkins. Ardeath, you don’t eat the strings; you eat the inch-thick (more or less) flesh between the skin and strings. You can also roast the seeds; they’re very tasty. The pie pumpkins are smaller, more flavorful and less watery than the Jack-O-Lantern pumpkins. I am wanting to make this for a work luncheon. If I soak the lentils the night before and start everything that morning do you think I can accomplish this in 4-5 hours? Hard to say. You don’t want the lentils to get too mushy. But I’d say give it a shot and let us know how it goes! I am assuming the lentils are dry when you put them in the crock pot. No need to soak them first? That’s right. They are dry lentils that have not been soaked. This sounds so hearty and I love that it can just cook away in the crockpot. yum- love pumpkin and lentil together!